The video above can mean only one thing: November is here and that means metal. Well, it does at the Swedish HQ of developer Toontrack, which annually celebrates the lilting tones and figures of heavy metal in its various shades. Metal is a genre that lends itself to the usual lexical excess of sub-genre - one merely replaces 'heavy' with 'black', 'death', 'thrash', 'badger' and so forth. 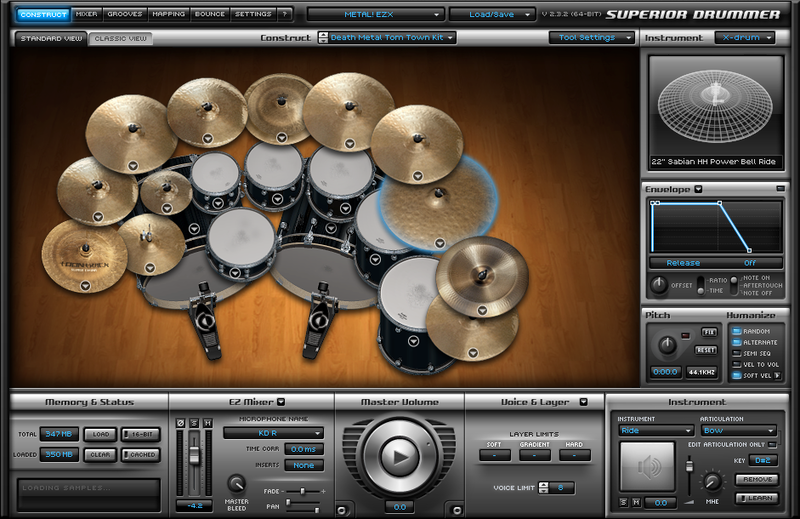 For Toontrack's 2013 celebration of Metal Month, the first product out of the bag is an expansion for EZdrummer and Superior Drummer, both sample-based percussion plug-ins of immense facility. 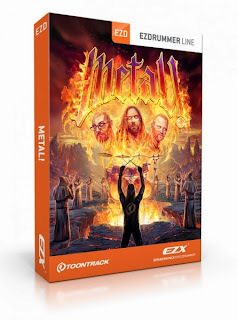 Toontrack buffs will note that producer Daniel Bergstrand was also involved in the creation of DfH and Metalheads, but for the Metal! sessions he took to a new recording facility, Tanken Studio in Norway, in which to capture a variety of primarily DW Collector and Ludwig drums, plus cymbals by Sabian, Zildjian and Masterworks. Bergstrand and co-conspirators Mark Lewis and Jason Suecof mixed the takes into: "A nine-headed behemoth that leaves nothing but rubble behind." Nothing? "Nothing," it says here, failing to account for another three kits listed in the Presets menu at top left. Anyway, Metal! offers 12 kit configurations plus MIDI grooves by the man behind much of Toontrack's Library Of The Extreme expansions, Dirk Verbeuren. As is common to every EZX, there's a healthy batch of MIDI performances to be auditioned, then dragged and dropped into one's sequencer for editing. This lot is organised into 10 songs, each of which is broken down into such sections as intro, verse, chorus and the like, with many featuring variation subsets. Let's give 'em a whirl, shall we? As you can hear, there's good timbral variety and, when the grooves are played in context of a full song arrangement, they should come across as none-too-mechanical. We've skin sounds from punchy rock to the thud-click of metal, a sound notable by attenuated midrange. The resulting way-down thud provides a foundation for wall-of-noise guitar and bass, while the click cuts through so the drumkit doesn't get swamped by towers of enraged Marshalls and a singer screaming 'waaaargh! ', 'Sataaaan's badgers! ', etcetera, via fricative-assaulted larynx. It's not all pure metal, however. Certain kits have more midrange body making them suitable for a broader range of rocking genres. Verbeuren's performances add up to a tasty set of MIDI grooves, with plenty of dual kick-drum moments and flamboyant journeys across the toms, but seasoned EZXers may come to feel a sense of déjà vu. To the untrained ear, Metal! sounds rather a bit like Toontrack's other HM percussion expansions. Yes, the MIDI files are different, although generically similar, and the samples were captured in a different studio, but there are only so many ways you can record metal drums. Homogeneity is to an extent inevitable. The main difference is that Metal! 's 12 kit configs are considerably more than the number offered by related titles. To get a better idea, you'd do well to audition the range and, rather conveniently, Euro distributor Time+Space provides audio demos on the product pages for DfH, Metalheads and Metal Machine - click the links and hit the audio players, noting that demos of the latter two feature song arrangements with guitars and the rest. 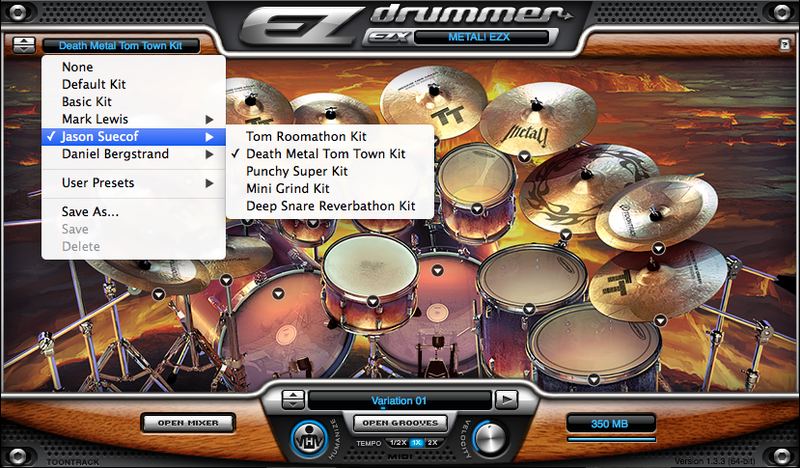 If you're new to EZplayer or Superior Drummer and in search of a slick and versatile way to whip up human-sounding rock and metal percussion parts, both EZX hosts are capable of delivering stunning results deployed either as plug-ins or stand-alone instruments when hosted by freeware offering Toontrack Solo. SD costs more, but offers a sight more flexibility when fine-tuning the kit and the virtual ambient space in which it sits. 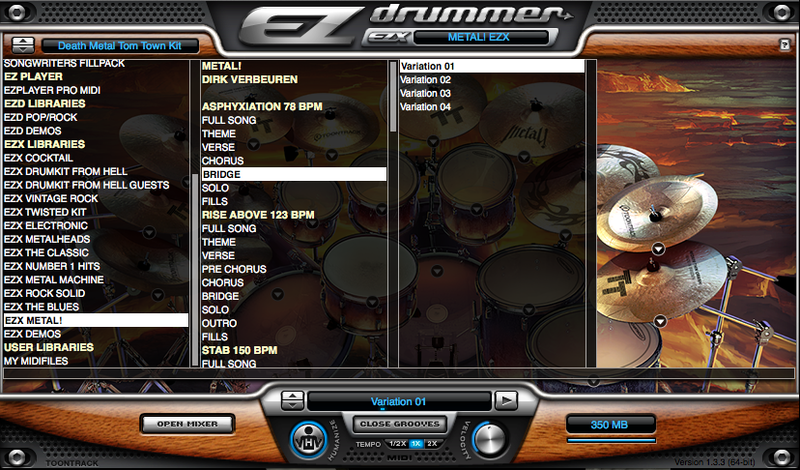 As for which EZX title, or titles, to go for, let your ears decide by auditioning the audio demos linked above. 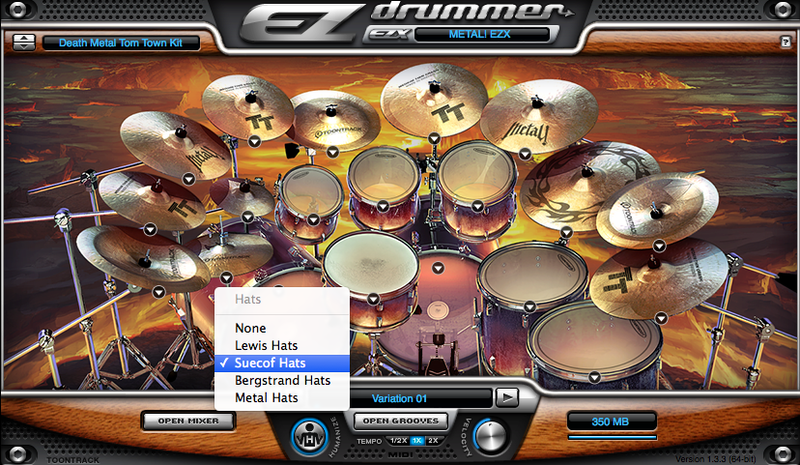 EZXs are cracking value and die-hard metallurgists might well acquire all those mentioned here to enjoy the subtle differences between kits and the skin-bashing panache of some of the world's finest metal drummers. If you're already up to your pits in EZXs, however, bear in mind you can just buy the MIDI files as a separate pack for £19.95 / €25, which is a mercy. Metal! gets a definite horns-up, further entrenching Toontrack's position as a premier provider of DAW-based metal drums and providing a promising opener for this November's flurry of product launches and events. Zip along to Toontrack's Metal Month page to discover what else is afoot.